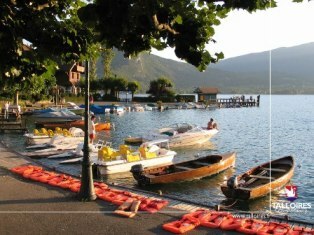 Annecy is a beautiful pre alpine lake in the haute savoire departments of France and only 50km south of Geneva and Switzerland. 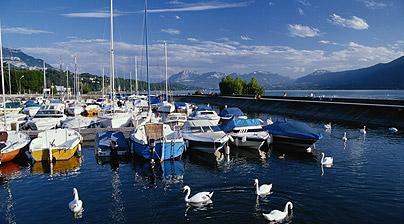 Lake annecy its town and villages provide an abundance of interesting places to visit and exciting things to do. Whatever your choice, culture, gourmet, fine food and wines, lazy days, sport and nature - it can be found easily in the Annecy area. Duingt Accommodation The imposing silhouette of Chateauvieux has kept guard over Duingt since the 11th Century. In the heart of the village, the houses have retained their local character. At the entry to the Combe d'Entrevernes, another castle, completes this picturesque place. Bout du Lac Accommodation A small resort near to the lake (close to Lathuille). A picture postcard village in the heart of the alpine meadows with their traditional farms and chalets. Mixture of clear wood and old stone give that special tint to the colours of the mountains. Menthon St Bernard Accommodation A historic, legendary castle nestling at the foot of pink-tinged mountains at sunset and towering above a village, picturesque old fashioned hamlets and a unique lakeside walk. A joy to behold all the year round. Veyrier Du Lac Accommodation A favourite resort for nature lovers, and much admired by painters and poets. Nestling at the foot of the Mont Veyrier (1293m), the village overlooks the Lake and enjoys maximum exposure to the sunshine. 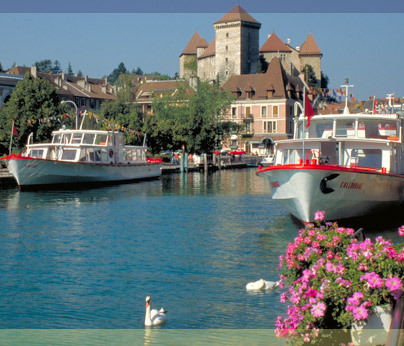 Annecy Old Town Accommodation The beautiful old town of Annecy is situated at the north west tip of its lake. Geneva Airport Accommodation Geneva Cointrin Airport a great destination for accessing the lake and mountains region. 1 hours drive from Lake Annecy. Talloires Accommodation This historic village is one of the most attractive in the French Alps. 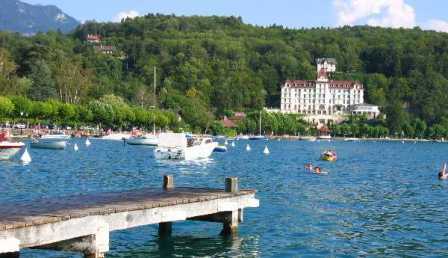 Talloires nestles in a beautiful bay on the shores of Lake Annecy. 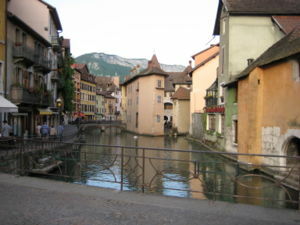 Annecy Le Vieux Accommodation Not to be confused with the Vielle Ville (Old Town) this predominately modern lakeside suburb is a pleasant 20 minute stroll along the lake from Annecy. Doussard Accommodation A smiling, friendly village at the foot of the mountains. 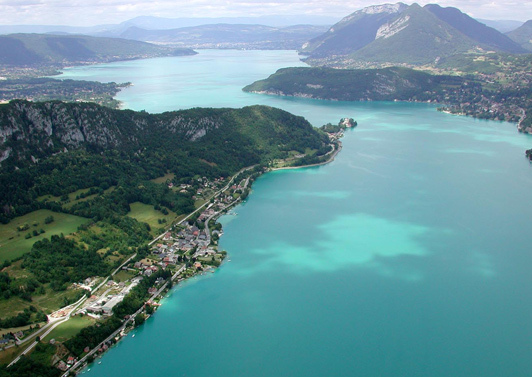 Doussard is called the source of the lake as the greater part of the waters feeding Lake Annecy come from its rivers. 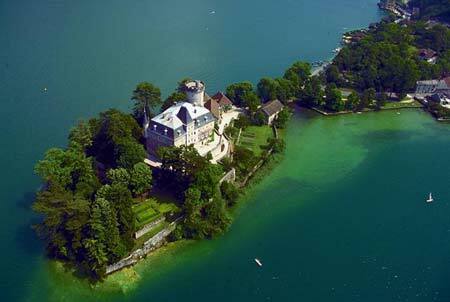 Saint Jorioz Accommodation Situated on the western shore 10 km from Annecy. This pleasant lakeside resort is overlooked by the Semnoz mountains and enjoys beautiful views across the lake towards Menthon and Talloires. Sevrier Accommodation Situated on the western shore 4 km from Annecy. This pleasant lakeside resort is overlooked by the Semnoz mountains and enjoys beautiful views across the lake towards Veyrier du Lac. 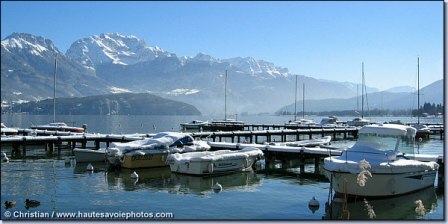 Lac du Bourget Accommodation The Lac du Bourget ("Lake of Le Bourget") is a lake in the Savoie department of France. It is the largest and the deepest lake of the country. The most important town on its shore is Aix-les-Bains. 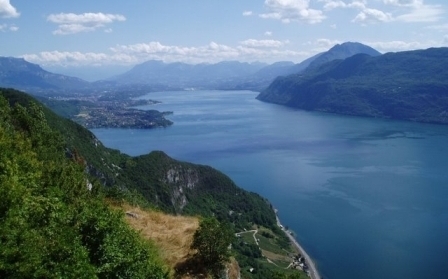 Chambery, the prefecture of Savoie, lies about 10 km south of the lake. Bauges Accommodation Surrounded by cities of Annecy, Aix-les-Bains, Chambery and Albertville, The mountain range of the Bauges in Savoie (Alpes, France) looks like a fortress from a far, but question first appearances... Inside the countryside slants slowly toward the villages, vast fields and forests. Lake Annecy - Veyrier du lac village: Very luxury villa for 10 persons, swimming pool and Jacuzzi. High standing villa in the village of Veyrier Lake (East bank of the Lake Annecy), 5 bedrooms and 4 bathrooms, panoramic view of the lake, terrace and garden with swimming pool and jacuzzi. The village center is 2 minutes walk and the lake with all the activities at 500 m.
Lake Annecy - Sevrier: Beautiful house with panoramic views of the lake, 5 bedrooms, heated pool, sauna, gym. A sumptuous hotel in the bay of Talloires in fron of the lake next to the little port area and the beach is on a short walk away. This lakeside Villa has 4 bedrooms plus a mezzanine so it's a great place for an exclusive stay by the lake. Lake Annecy - Veyrier du Lac : It's a very comfortable house with a garden direct with access to the lake for 8 people maximum. House on one floor, large living room, dining room open on the terrace and the garden is shaded by many trees. 4 bedrooms, 2 bathrooms. The Garden has direct access to the lake, with a superb view on the old town of Annecy. Private pontoon and mooring for one boat. 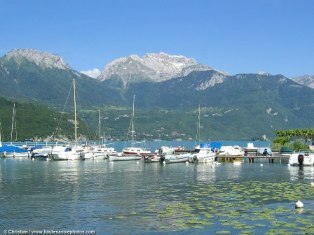 6 room property located near the lake shore, 5 km from the town of Annecy. Allée du Château is a lovely little house in an extremely quiet part of the village but only a short walk away from everything. Ramponnet is a charming town house of 80m2. It is nestled in the ancient center of Ramponnet hamlet only 10mins walk from the center of the village of Menthon-Saint-Bernard. 49 rooms, buffet breakfast, satellite TV, free internet WIFI, bar, private car park and garage all 200m from the lake and old town. Lake Annecy - Annecy le Vieux : Very charming villa close from the lake side and all activities Lovely villa with 3 bedrooms and 3 bathrooms, Ideally located in Annecy le vieux with direct access to the petit port and the beach of Albigny. Place Saint Maurice is a nice apartment overlooking the waterways in the old town. A charming 2nd floor apartment overlooking the canal suitable for 6 people. 4 rooms on two floors with parking space. 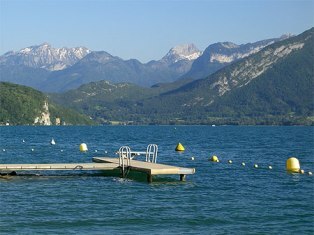 Lac d Annecy - Annecy lakeside : High standing apartment for 4 people, 2 bedrooms, panoramic terrace, small lake view. 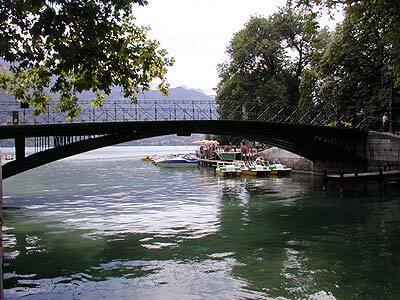 Lake Annecy - Annecy: In the heart of the city, very design apartment for 2/3 people. Very design apartment and ideally situated at the heart of the villa and by the lake. Lake Annecy - Village of St. Jorioz: In an exceptional lake and mountain views: Apartments 1 to 4 bedrooms with balcony terrace, apartment hotel, serviced apartments, SPA center, Space welfare with care, indoor, outdoor and children, tennis, squash, pony club and restaurant.